Since 1978, Fitzgerald Moving & Storage has provided high quality moving services to businesses across the Baltimore - Washington metropolitan area. You can trust the Fitzgerald Moving & Storage team to efficiently pack, wrap, transport and unload all your office equipment and furniture so that you can minimize downtime and look forward to settling in to your new business space. The city of Baltimore, Maryland, is part of the Baltimore - Washington metro, and is home to many commercial businesses and offices. 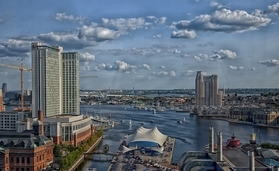 Tourism is important to the economy of Baltimore, as is the port; the World Trade Center Baltimore is key to international commerce in the area. If you have an office or commercial business located in Baltimore we would be happy to help you relocate. Whether you're part of a huge commercial business or a small corporate office, we are the experienced Baltimore movers for you; our team can help make even the most complicated move feel simple. If you require additional moving services, don't hesitate to get in touch – we will always try to accommodate your needs. Trusted for over 50 years by corporations across Baltimore and the Washington metropolitan area. Efficient – we'll help minimize office downtime. Custom services – we'll provide you with a custom moving plan, designed for you; no two moves are ever exactly alike. Organized – We'll note every item to be moved so we are fully prepared and know the most efficient way to pack ahead of time. Whether you're ready to set the date on your move or are still researching the best way to go about relocating an office or commercial business, we'd love to hear from you! For advice or guidance on office relocation or for your free quote, contact Fitzgerald Moving today.